When battling cancer, everything is on the table. Radiation therapy. Surgery. Chemo. Often there is not a single answer, and treatments are combined for maximum impact. Curing cancer, of course, is the ultimate goal, but until a cure for all cancers can be found, researchers are also pursuing other goals, such as keeping cancer from spreading, slowing the growth rate of the cancer, and alleviating some of the side effects of treatments. Advances in nanotechnology have enabled researchers, like Associate Professor Z. Basar Bilgicer, Research Assistant Professor Tanyel Kiziltepe, and their team in the Department of Chemical and Biomolecular Engineering at the University of Notre Dame, to encapsulate cancer-fighting/cancer-killing drugs into nanoparticles that can deliver therapeutic drugs directly to the site of a tumor, effectively avoiding healthy tissue and minimizing adverse reactions. These particular researchers have invested years of study in the area of nanomedicine and targeted drug delivery, as well as in biomolecular interactions (how drugs work and interact with each other in the body). Most recently, they have combined their expertise — with two synergistic drugs — to help knock out multiple myeloma (MM). The second most common hematologic malignancy in the United States and currently incurable, MM affects the plasma cells in bone marrow. In boxing, it’s the “one-two punch” that often defeats an opponent. In cancer research, it’s synergy — identifying which drugs can be combined, and in what ratios, to most effectively kill myeloma cells and breast cancer. Combining drugs is not new, but this team’s nanoparticle formulation platform technology and technique for dosage of delivery is. 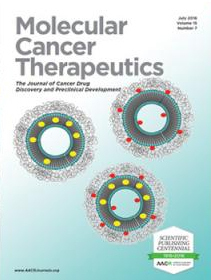 Published in the July issue of Molecular Cancer Therapeutics, the team’s most recent work focuses on finding the best ratios of carfilzomib and doxorubicin, two cancer-fighting drugs that have a track record of working well together and are FDA approved for the treatment of MM. Often these drugs, and others like them, are injected individually into patients, each arriving at the site of a tumor and being absorbed by cancerous cells at different rates, effective but not optimum. With their considerable experience developing nanoparticles that transport drugs to tumor sites, Bilgicer and Kiziltepe were well aware that dealing with two or more drugs would not be a simple matter of putting carfilzomib and doxorubicin into one nanoparticle and sending the particle on its way. Even packaged together, each drug would still exhibit different properties, metabolisms, and biodistributions. However, the Notre Dame team has been working to control the ratios and release of these drugs within the nanoparticles once they reach the tumor site, exploiting the particle and its properties to better manage drug delivery and improve patient outcome. What the team found is two-fold, the drugs work even better together when packed in a single nanoparticle, and at a lower dosage than needed when they are delivered individually. The timing and proximity of their tandem delivery to the tumor site shows improved therapeutic effect. To date this work has been funded by the ITxM Blood Science Young Investigator Award via a research grant from the Leukemia Research Foundation, the Walther Cancer Research Institute, and a Department of Defense Directed Medical Research Program Career grant. Ongoing studies are being conducted at Notre Dame on these first-generation dual-drug nanoparticles, providing rationale for clinical development and evaluation. But the combination of carfilzomib and doxorubicin in a nanoparticle holds great promise. Bilgicer joined the University in 2008. In addition to his appointment in chemical and biomolecular engineering, he serves as a concurrent associate professor in chemistry and biochemistry. His research focuses on understanding the basic principles of antigen-binding biomolecular interactions, as well as the design of multivalent therapeutic and diagnostic molecules with which to deliver novel solutions to complex diseases, such as cancer, autoimmune diseases, and allergies. He received his bachelor’s in chemistry from Boğaziçi University in Turkey in 1998 and his doctorate in chemistry from Tufts University in 2005. Prior to joining the Notre Dame faculty, he served as a postdoctoral fellow in the George M. Whitesides research group at Harvard University from 2005 to 2008. Focused on nanoparticle based drug delivery, biochemical stabilization of biomolecular therapeutics, and pre-clinical drug validation in cancers, Kiziltepe also joined the University in 2008. She received her bachelor’s in chemistry from Bilkent University in Turkey in 1998 and her doctorate in biological chemistry from Massachusetts Institute of Technology in 2004. Prior to coming to Notre Dame, she served as a scientist at Cerulean Pharmaceuticals in Mass., was a faculty member at Harvard Medical School, and a postdoctoral fellow at the Dana-Farber Cancer Institute, also in Boston. Originally published by Nina Welding at conductorshare.nd.edu on July 07, 2016.